The article begins with much more structural detailing, repeating the use of in situ reinforced concrete. The infamous collapse of the Ronan Point, an inadequately constructed system-built point block nearby in Newham, occurred two days after Goldfinger’s press conference in May 1968. In this text the following year, he sets out Balfron’s materials and detailing, perhaps to distinguish the quality and robustness of his design and construction. Goldfinger provides more detail on the social experience of the tower - especially how the system of access galleries has encouraged greater interaction between residents which he considers to be “much more satisfactory from a social point of view than the so-called ‘point-block’ arrangement, when only a small number of flats can be grouped around an internal corridor.” This, again, may be in anticipation of potential detractors following the intensified criticism of sociological implications of high-rise living. Goldfinger provides further information on the following two phases of works that will take place on neighbouring sites within the Brownfield Estate. Carradale House is already under construction but the Burcham Street buildings are also detailed. 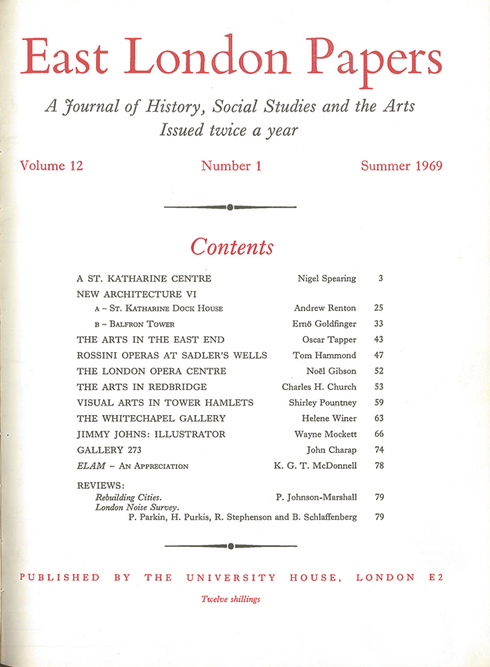 Finally, the article is accompanied by four images; an ‘air photo montage’ of Stages I and II of the project from the south-west; a photograph of Balfron Tower from the north-west; and two photographs of interiors - a bedroom and entrance hall - which appear to be of the Goldfingers’ flat at the tower. Ernö Goldfinger, ‘Balfron Tower’, East London Papers, 1969, Volume: 12, pp. 33-43. Ernö Goldfinger, DPLG, FRIBA, FSIA, architect and town planning consultant, is a frequent contributor to the architectural press, a broadcaster and has recently completed a lecture tour of the USA. Buildings designed include the Ministry of Health complex on the Elephant and Castle (Alexander Fleming House). The scheme described is the first of the last three phases of what is known as Brownfield Estate. This GLC Estate is situated to the east of Crispin Market, bounded to the west by an almost disused rail cutting, to the east by Brunswick Road (the north-south arm of the ‘Motorway Box’ leading to the Blackwall Tunnel), to the north by a proposed open space and the playgrounds of a comprehensive school yet to be built, to the south by an open space at the junction of the Commercial Road and the Motorway Box. The whole area will ultimately be a pedestrian precinct with no through traffic whatseover. All common vertical services are carried in an isolated service tower, connected with the main block by means of bridges serving the middle level of a three-storey high component cell (comprising an average of 18 flats). From access galleries, connected to the service tower by bridges, flats above and below are reached by means of private staircases. 35 2-room flats, with 1 living room, 1 bedroom, 1 kitchen and bathroom with WC. 84 3-room flats, with 1 living room, 2 bedrooms, 1 kitchen and bathroom with sep. WC. 17 4-room flats, with 1 living room, 3 bedrooms, 1 kitchen and bathroom with sep. WC. 10 5-room flats, with 1 living room, 4 bedrooms, 1 kitchen and bathroom, 2 sep. WC. Of the 35 2-room flats some are for old people. 12 1-room and 2-room flats for old people are situated in a 2-storey block facing south, forming a separate building. A local shop with one 3-room flat above. Communal services comprise 2 drying rooms and 2 hobby rooms which are situated in the service tower. Block A is a 26-storey block of flats and is an in situ reinforced cross-wall structure linked to the service tower by precast concrete bridges at every third floor. The type of structure chosen facilitates the repetitive use of formwork. To speed work on the site all intricately shaped parts of the structure, such as stairs and balcony parapets, are in precast reinforced concrete. The building and tower are founded on 30 in. diameter 60 ft. long cast in situ friction and end-bearing bored piles. Blocks B and C are constructed in load-bearing brickwork supporting in situ reinforced concrete floor slabs. Garages linked by concrete ramps have been constructed below ground level and are roofed by large-span in situ concrete coffered slabs, supporting the playgrounds and gardens above. The reinforced concrete, where exposed to view on the external elevations, has been bush-hammered to expose the aggregate. All special structures and external concrete walls are constructed in waterproof concrete. The heating is supplied from a central boiler room containing four fully automatic oil-fired boilers, situated on the top of the service tower. The boilers supply lock pressure hot water to A and B blocks with sufficient capacity to supply a future D Block. Distribution is by means of a reverse return system supplying low-pressure hot water to a warm air heater in each flat. From this heater, warm air is distributed through grilles to living areas. Each flat is served by an independent hot water system consisting of cold water break-tanks and electric water heaters. The cold and drinking water services to each flat are supplied by break-tanks in the service tower which are filled by fully automatic booster pumps from the break-tank on level IIIA. The fire service consists of a wet riser to the roof of the service tower with landing valves on each access landing. The riser is served by an independent electric booster pump and stand-by diesel booster pump. Both are fully automatic. Hose reels are provided in the garage. The ventilation system consists of three sets of fully automatic duplicate fans on the roof of Block A, providing three separate extract ventilation systems. Each system serves external bathrooms and WCs in Block A. The electrical supply to the dwellings in Block A is derived from the Electricity Board’s sub-station in the basement. Lateral services inside each dwelling are provided from three separate sets of tenants’ rising mains, installed by the Board. The wiring system in dwellings consists of PVC cables throughout. Tungsten lighting is provided in all dwellings together with general purpose socket outlets fitted to the Parker Morris Standard. All wiring in the flats is concealed and lighting switches are fitted in the door-frames. Water heating for kitchens and bathrooms is provided electrically. In the old persons’ dwellings, separate electric water storage heaters are provided for baths. The communal radio/television aerial system is wired to flush aerial outlets in all living rooms of the dwellings in A and B blocks. The lift tower houses the public (landlord’s) electric service meter room which is supplied separately from the London Electricity Board’s mains. Two passenger lifts serve the access levels and the lift motor room is on level 25A. Fluorescent lighting is provided to staircases and for the access balconies in blocks A and B inside miniature lamps fed in flush and semi-flush bulkhead fittings, and in the garages 5 ft vapour-proof fittings are installed. The public lighting is time-switch controlled from public lighting control units in the lift tower. In the lighting of the approach ways, garage ramps and gardens, mercury vapour lamps in special reflector-units mounted on the roof of Block A shine down through slots in the roof parapet, thus obviating the use of lamp standards. After completion of the first part of the scheme my wife and I had the opportunity to live for two months in one of the flats in order to gain first-hand experience of the functioning of the building and to observe possible shortcomings. This also enabled me to correct some details of the buildings which by more complicated means of communication is made practically impossible. The method which we used for arriving at the findings was fourfold. The first involved direct observation by ourselves (my wife and myself living in the flat) and communicating with our neighbours. The second part made use of reports from the Tenants’ Association, and the third source was the Clerk of Works report. Finally, as an architect, I made observations regarding planning, future planning, and detailing. The success of any scheme depends on the human factor - the relationship of people to each other and the frame to their daily life which the building provides. These particular buildings have the great advantage of having families with deep roots in the immediate neighbourhood as tenants. In fact most families have been rehoused from the adjoining streets. Of the 160 families, all except two came from the Borough of Tower Hamlets. The nine access galleries form ‘pavements’ on which the normal life of the neighbourhood continues very similar to a ‘traditional East End’ Street. On seven of these pavements there are 18 front doors, while on two levels, where there are maisonettes, the ground floor has seven and the fifteenth floor has 13 front doors. As far as possible, people from the same area were rehoused together, street by street. This system of access galleries has proved much more satisfactory from a social point of view than the so-called ‘point-block’ arrangement, when only a small number of flats can be grouped around an internal corridor. It also provides through ventilation as each flat has two aspects. Provisions lacking are the common shopping and welfare facilities. This is a delicate point which has been plaguing housing for half a century - the difficulty of deciding how much of the common facilities are attributable to housing proper and how much comes under other headings. This is, of course, a problem of financial and organizational strategy which is far from having been solved on the political plane. For the toddler - in immediate contact with his mother - large terraces have been built in each flat, where the mother can supervise her small child or children from the dining/kitchen or the living room. On the ground floor, for these same children and those of up to say 5 years old, there is a sunken play area with slides, towers, water and a sandpit. These are to be completed by a supervised day nursery, placed in the proximity of this play area, so that the whole thing can be supervised. Two drying rooms are also provided in the service tower. Underground garages for 79 cars and access for service and other vehicles at low level not cutting across pedestrian access. The whole area will be a pedestrian precinct with underground garages and car access at low level. The management seems to be working well on the whole, which is not surprising in view of the GLC’s great experience over so many years in this field. Nevertheless, at the very beginning a great mistake was made by not providing the tenants with adequate information about their new and unfamiliar building. This caused considerable trouble with such trivial things as window cleaning, fixing curtain rails, the use of central heating, and the availability of garages and storerooms. The tenants were simply not told. Explanatory leaflets have now been provided which have helped a lot. On the whole, the general disposition of the buildings and the flats is acceptable. I am prepared to repeat the same design in future schemes. The main characteristic of the building is the separation of dwellings from communal services. These latter are housed in a separate tower, connected to the 26-storey block of flats by bridges and access galleries every third floor. Thus all noisy machinery, including lift motors, water pumps, fire pumps, rubbish chutes, and the boiler house at the top, are completely insulated from the dwellings. Each dwelling is insulated from its neighbours, sideways by a 9 in. concrete wall and top and bottom, by a 1 ft. thick concrete floor, which is composed of 9 in. structural slab and 3 in. floating screed on a fibreglass blanket. There are only two lifts provided in this building, which proved inadequate while tenants were moving in, but settled down ultimately. When two lifts are working this is just adequate, but when one lift is being serviced or breaks down, the waiting time is still too long. Because of sanitary regulations the access galleries had to be left open at the top (five pitches open on to them). As they face east, in the winter months they proved very cold. Thresholds for the front doors were not originally provided and cold winds blew into the flats. This has been remedied by the provisions of a threshold for each flat. Windows have a copper gasket which proved satisfactory from the point of view of thermal insulation and sound insulation. Unfortunately, in certain high winds these copper gaskets vibrate, and, although they do not let the air through, create a trumpeting noise in flats at high levels. These have now been redesigned. Also being redesigned is the so-called permanent ventilation, which is required by the London Building Acts. Tenants very wisely blocked this up as soon as they moved into the flats. The front door locks have proved inadequate and, being a general GLC issue, have been re-examined. No door bells were provided, the letter box plates forming knockers. The result of this economy was that many tenants fixed electric door bells in odd places, with wires trailing inside the flats. This was a pity, after so much thought had gone into avoiding surface wiring. In eight dwellings out of 150 the heating did not work. The builders had left bits of cement in the drainage system. The roof over some garages was still leaking. Some window sills were not properly fitted. These are teething troubles and have been remedied point by point. The main characteristic of the building is the separation of dwellings from communal services. These latter are housed in a separate tower, connected to the 26-storey block of flats by bridges and access galleries every third floor. Thus all noisy machinery, including lift motors, water pumps, fire pumps, rubbish chutes, and the boiler house at the top, are completely insulated from the dwellings. Each dwelling is insulated from its neighbours, sideways by a 9 in. concrete wall and top and bottom, by a 1 ft. thick concrete floor, which is composed of 9 in. structural slab and 3 in. floating screed on a fibreglass blanket. There are only two lifts provided in this building, which proved inadequate while tenants were moving in, but settled down ultimately. When two lifts are working this is just adequate, but when one lift is being serviced or breaks down, the waiting time is still too long.